FM radios are used just about everywhere – in defense technology, in fire and police departments and even on oil rigs. 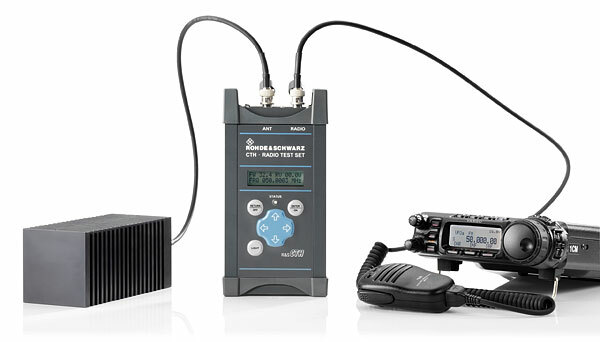 With the new R&S®CTH100A and R&S®CTH200A portable test sets from Rohde & Schwarz, users can quickly test whether their FM radios function properly. These easy-to-use, pocket-sized test sets are ideal for routine testing. The R&S®CTH family of portable radio test sets was designed for fast and easy testing of analog FM radios in the field. Both test sets perform frequency and power measurements on transmitters and receivers. The R&S®CTH200A also finds cable faults between the radio and the antenna and performs over the-air measurements. Users can check the functionality of their radios just before they are put into operation. The compact, battery-operated, 4.05" x 7.95" x 1.45" (103 mm x 202 mm x 37 mm) test sets only weigh about 1.2 lb (540 g). With their light-weight, sturdy aluminum enclosure, splashproof in line with IP54, these rugged test sets can be taken anywhere and everywhere. They can withstand even harsh environmental conditions and were designed for operation in the field. Simply connect the radio or antenna and press a few buttons to perform go/no go tests. All results, settings and status information are clearly shown on an easy-to-read display. Rohde & Schwarz put its many years of experience in secure communications into the development of the R&S®CTH family. The R&S®M3xR family of software defined radios from Rohde & Schwarz can also be tested with these test sets. The result is a practical solution for both public safety authorities and organizations and the defense sector.